I WAS saddened when I heard of the death of George Bason a few years ago. While he was never a star rider, he was from that essential band of devoted riders who form the backbone of the sport. Without so many of this ilk, there would be no speedway for the stars to shine. George was born in Marlow, Buckinghamshire. although an error in a 'Who's Who' in speedway misprinted his birthplace as Harlow, and that was perpetuated. As a rider he started on the pre-war amateur tracks at Longmoor (California-in-England) and Oxford (the site of the present track but much different then) where his opponents included Lloyd 'Cowboy' Goffe, Billy Newell and Danny Lee. He also rode at Crystal Palace in open meetings in 1938, and as a junior when the club briefly raced in the National League Second Division. At the Palace, Bason's career came under the watchful eye of the South African veteran Keith Harvey, while his rivals in junior races included Bernard 'Bronco' Slade, Charlie Challis and the Canadian wrestler turned speedway rider Eddie 'Flash' Barker. After the 1939-45 closure of speedway tracks for Hitler's ill-timed intervention and World War Two, the 1946 rider pooling took Bason to West Ham, then on to Wembley in August when 'Bronco' Wilson was injured. At the same time, West Ham were also allocated Charlie Dugard - the man who established Eastbourne in later years. Charlie didn't like the West Ham track, and he joined Wimbledon. Soon afterwards, Bason and Dugard clashed in an individual meeting at Wimbledon in a pile-up that left both with broken legs. For a week or so they were also in neighbouring hospital beds. "That's the nearest we came to being team mates for a second time that season," Bason told me years later. The 1947 and 1948 seasons saw Bason with Southampton in the National League Third Division, and in his early Bannister Court days he briefly succeeded Vic Collins as team captain. By 1949, Bason was riding for Liverpool, but these were changing times in the sport. As a legtrailer, Bason needed cinders to utilise his riding style, but tracks were increasingly using shale to cater for foot forward riding. 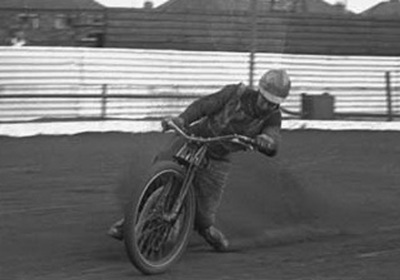 As with so many legtrailers, Bason found it hard to adapt and dropped out of the sport, although he did make a brief return in the early 1950s at Swindon. In 1953, he resumed racing in open meetings at what had been Longmoor, although by then the Berkshire track was known as California, and in 1954 he was an early member of their Southern Area League squad. California was ideal for Bason's style - it was a pure, deep dirt track, and he revelled in the conditions. But slick tracks like Eastbourne, Rye House, Ringwood, Aldershot and Brafield saw him floundering and he dropped out of the California team. But the venue also staged many open meetings, and Bason continued to turn out in these. While at Liverpool in 1949, Bason had also raced at Antwerp in Belgium, against Reg Duval, Bill Harris and the Belgian champion Lambert Dock. And with the decline of chances in England, he switched back to the Continent, racing in Germany and France until the 1970s. In 1978, Bason was among VSRA members who took part in the anniversary event at Hackney. His appearance was brief - he reared on the starting gate in his demo ride and injured his knee. For many years, Bason spent time encouraging young riders. These included Ron Sharp (New Cross and Stoke) and Ted Spittles (Ipswich). He was also a regular spectator at Oxford for many years and for some seasons was also mechanic for Oxford star Peter Robinson. I first got to know Bason in 1954, and have a fond memory of going to visit him and his family at his small-holding in Marlow, Buckinghamshire, where he combined vegetable growing with a garage and speedway bike tuning business. He showed me his collection of pe-war and post-war speedway magazines and programmes and we also mulled over his pre-war speedway and grass track racing activities. One of his favourite pre-war grass venues was Corfe Mullen in Dorset - even then dominated by Lew Coffin! And Bason was one of the 1939 pioneers who established speedway for the first time at Oxford's Cowley Stadium. After that initial meeting at California, I met Bason many times. He was always a gentlemen and devoted family man. His name probably hasn't carved a major niche in speedway history, but, as I said earlier he was - and so were many hundreds like him - part of the structure upon which the sport is founded. They deserve to be more than speedway's forgotten men. Bason was 86 years old at the time of his death in 2003. "A very interesting article. George Bason was a good friend of my father George Earle who had a garage in Marlow. Very pleased to see he is remembered. " "I have come into possession of a bike that I'm told George Bason may have owned. A light blue 1940 Triumph with a JAP engine. Great to read a little bit about him. " "Doug - it is possible the bike you mention was owned by George Bason and used by him for grass track racing in which he also competed at one-time." "Cheers John, it's good to hear a little confirmation - there's very little mention of him in grasstrack on the web. Mainly Speedway. We've got the bike running - it doesn't look like it's changed much over the years. " "Do you still have the bike and is it still running? Also Gramp was 90 years old when he passed away June 2004. "